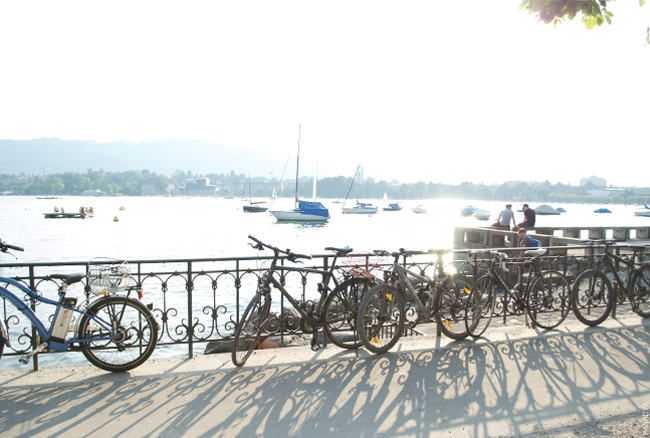 When we were in Zurich, the only request Clay had was to rent bikes (which were free!) and go ride them around for most of a day. I think I must have misunderstood, picturing a gigantic smile slapped on my face with the wind rolling through my hair while we rode along a sparkling lake like this. Approximately one hour into our disastrous bike ride, I was stopped in the median with cars whirring by us probably going no less than 50 miles per hour, frantically clutching to my handlebars for dear life. I'm definitely not an adventurous person when it comes to the combination of bikes, cars, and uphill, narrow roads with bike lanes that suddenly go from visible to non-existant. Needless to say, Clay had to care for an oversized baby (me) until we were able to get back to the view pictured above, where I ended up happily riding my bike at a slow, leisurely speed, and not one car in sight. This route was much calmer. When there are a bunch of dads pushing fashionable strollers down the walkway, I know that I'm back in the safety zone. And yes, we did swim in that chilled, sunny water. Perfecto. :) More on that later sometime. Oh my, your bike adventure sounds crazy, but I'm glad you were able to find a more peaceful, calming place for your bike ride! Your photos are beautiful, Danie! Aww sorry your bike adventure was so crazy!! GORGEOUS pictures though!! Hey Laicie! I WILL become brave one day. Thank you!